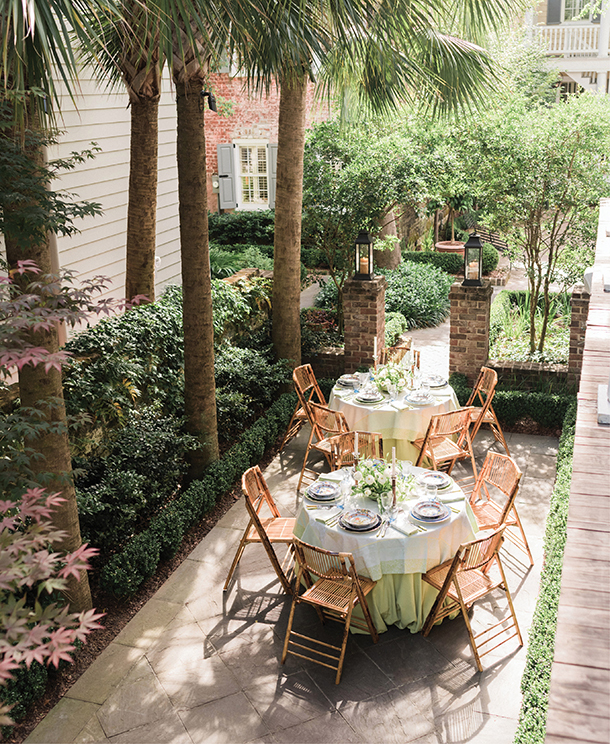 Lynn and her husband, Dean Andrews, host a springtime dinner party at their boutique hotel property, Zero George. Lynn and Dean prep ingredients for their Italian-inspired menu in the kitchen at Zero George. 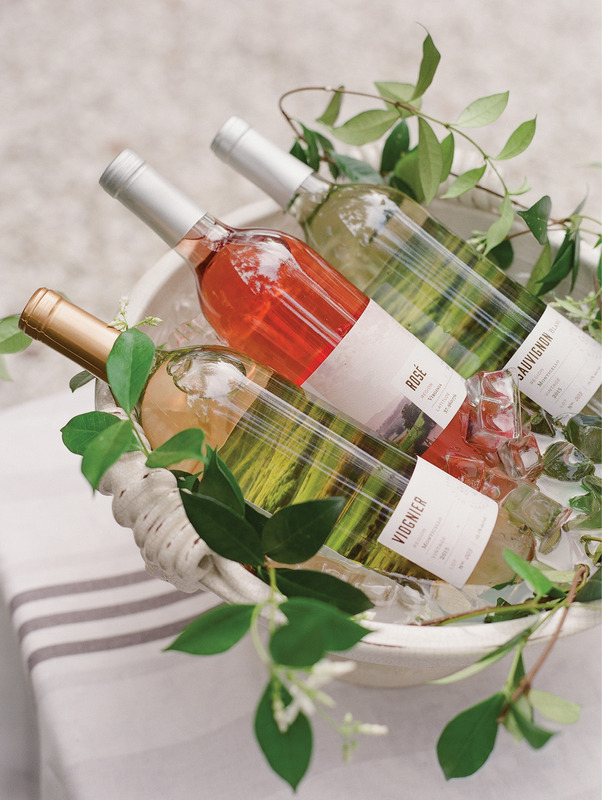 For the “bar,” Lynn filled a Vietri planter with ice and just-plucked jasmine vines to chill a variety of their Pippin Hill Farm & Vineyard wines. 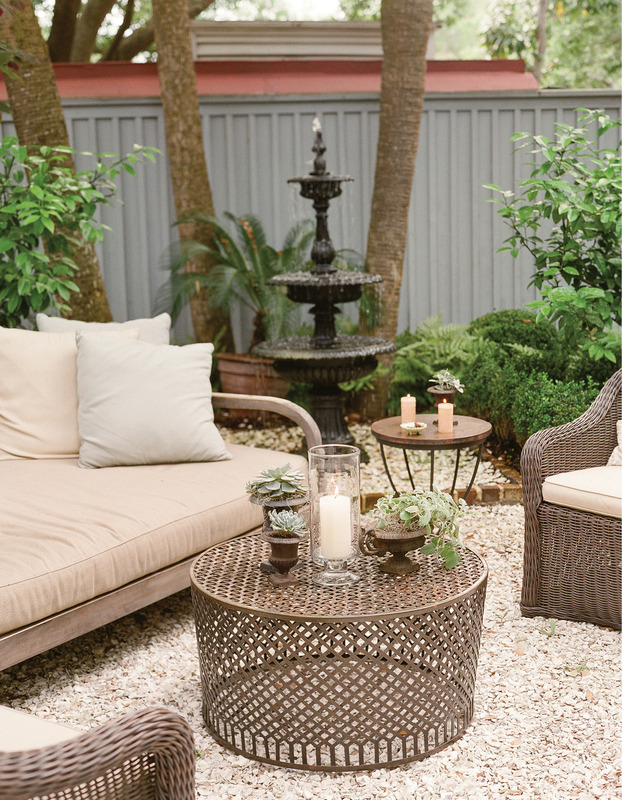 To turn a garden alcove into an inviting cocktail nook, Lynn arranged outdoor furniture and added candles and potted plants to enhance an oyster tabby patio. A small table (far left) topped with wines and glassware makes for an easy self-serve bar. The focus is streamlined and elegant, letting the outdoor environment take center stage. There’s a reason the folks at Vogue, Harper’s Bazaar, and Martha Stewart Weddings, among others, turn to Lynn Easton for style advice. She’s the arbiter of understatement, the Oz of fresh elegance. 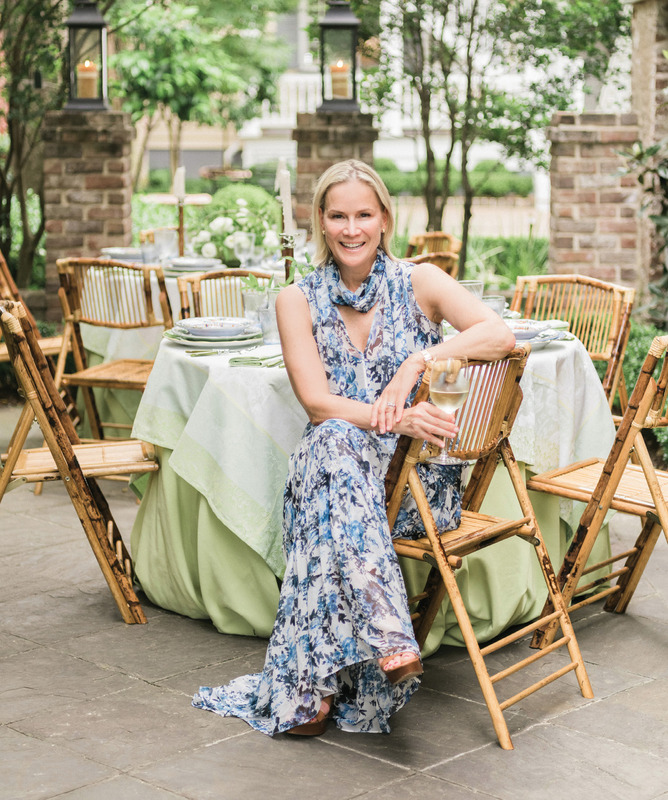 She sets a mood like nobody’s business—maybe because it is her business, as the founding director of Easton Events, which specializes in luxury destination weddings, and creative director/cofounder of Easton Porter Group, a boutique hospitality enterprise that brought us Zero George Street hotel and Cannon Green. Wander around Zero George and you’ll get an immediate sense of the sublime magic she works using nothing more than subtle neutrals, lush textures, thoughtful arrangement, and an abundance of candlelight. But Lynn’s flair for creating an inviting ambiance really shines when she brings her friends into the mix. 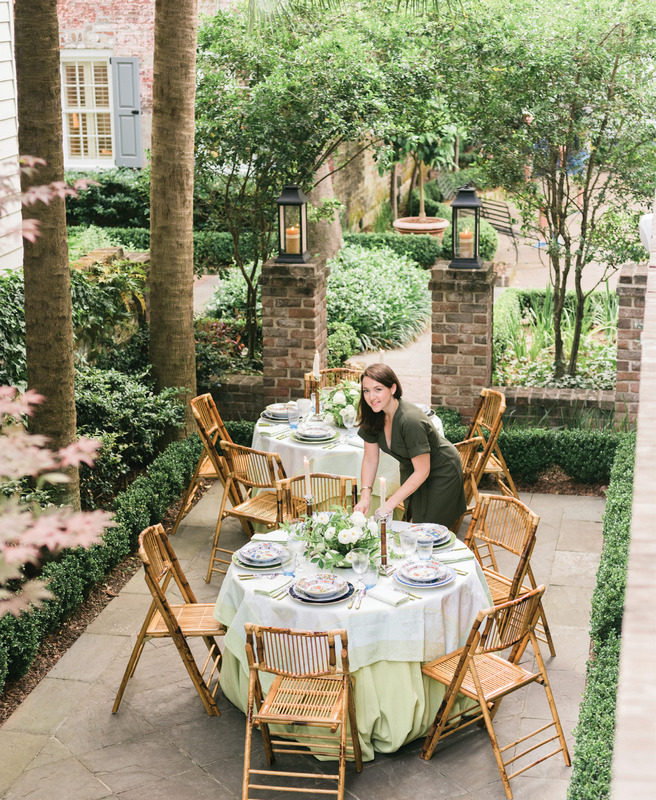 “Spring in Charleston is pure enchantment—if you love the casualness of outdoor entertaining as much as I do, there’s no better time,” she says. 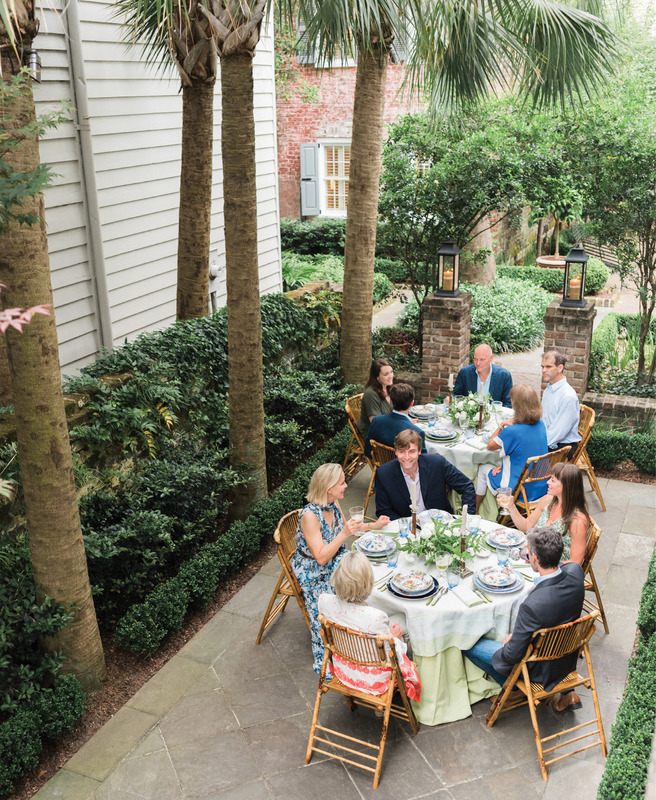 While in the midst of a major renovation at their Church Street home, Lynn and her husband, Dean Andrews, took advantage of Zero George’s courtyard and kitchen to share a simple garden supper with friends. Her secrets for a flawless spring fling? Luckily she shares those, too. - Pick a focus for the menu. 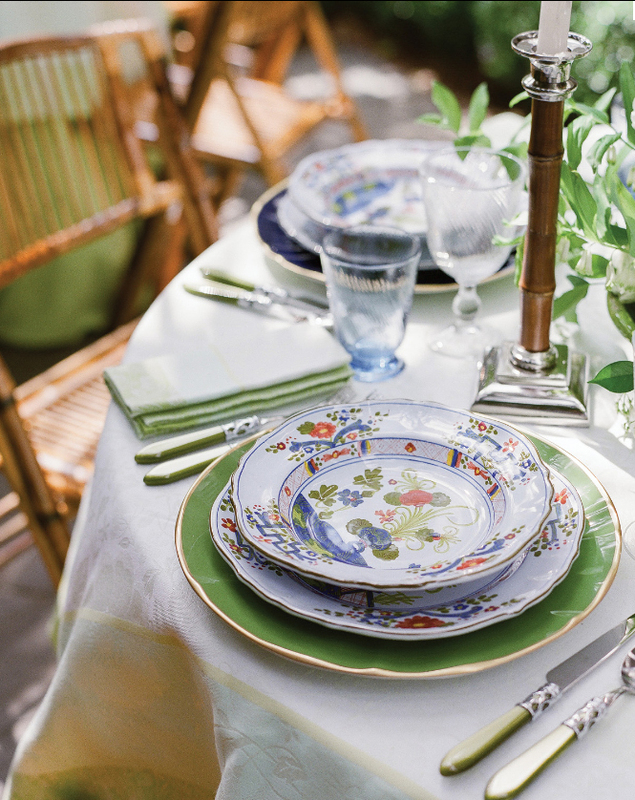 This one is Mediterranean, featuring Italian-influenced pasta, accented by Italian china and linens. 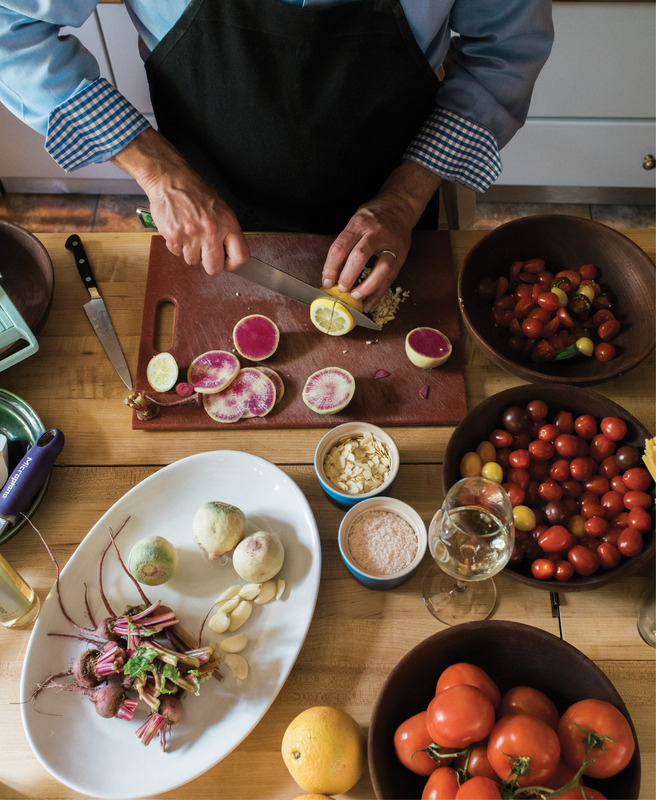 Lynn believes that “you eat with your eyes,” so she makes sure her menu complements her tablescape and vice versa. - Add your signature flavor. Lynn likes to make her go-to dressing: a homemade Champagne vinaigrette for the arugula salad. - Mix it up. 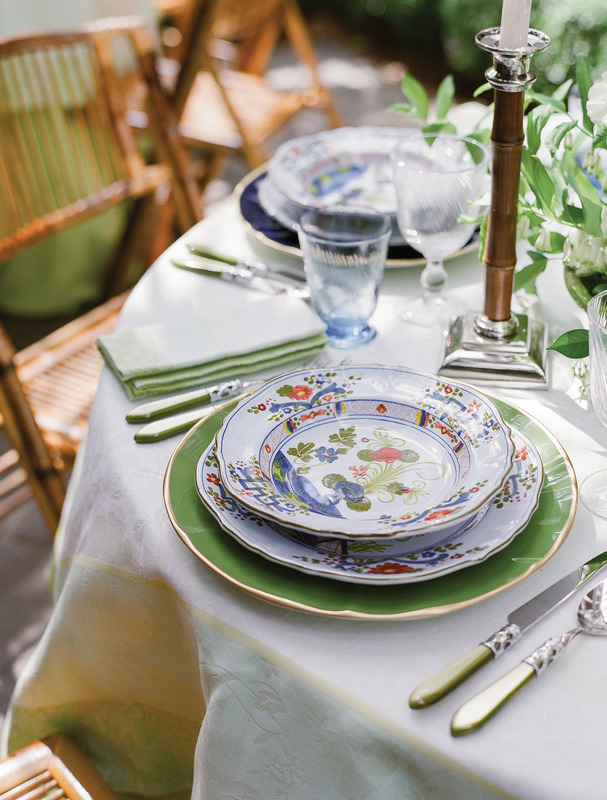 Don’t be afraid to indulge in a little pattern play—mix color, texture, and pattern in your table settings. 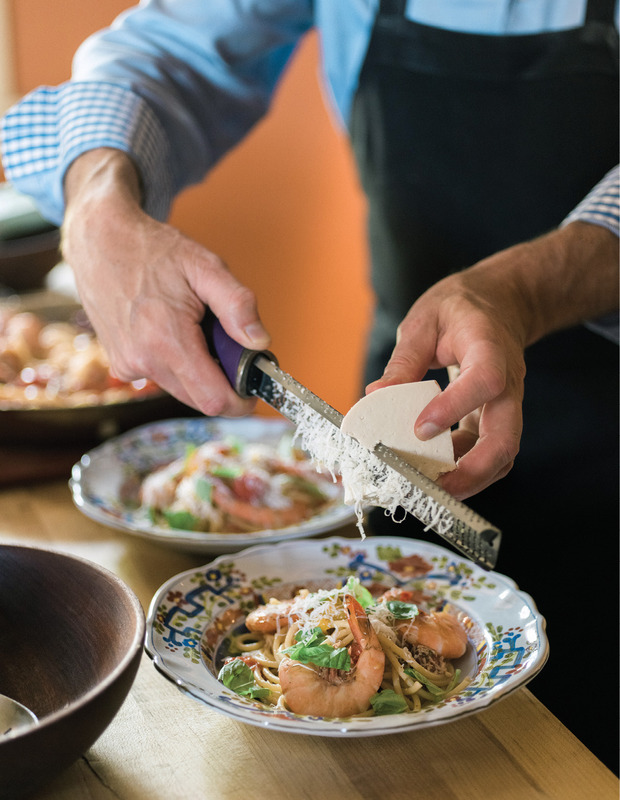 Here, Lynn combines handmade Italian plates and bowls with Anna Weatherly chargers. “I love the marriage of the traditional shape with the very bright and modern hue,” she says. - Offer subtle surprises with color. Add a refreshing pop to a table setting with a colored water glass. - Set up a self-serve station. 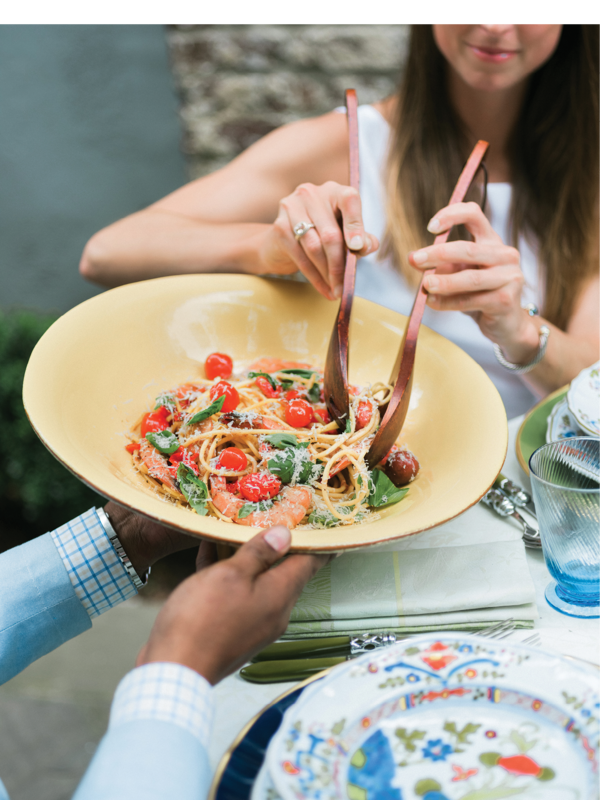 Make it easy for guests to serve themselves. 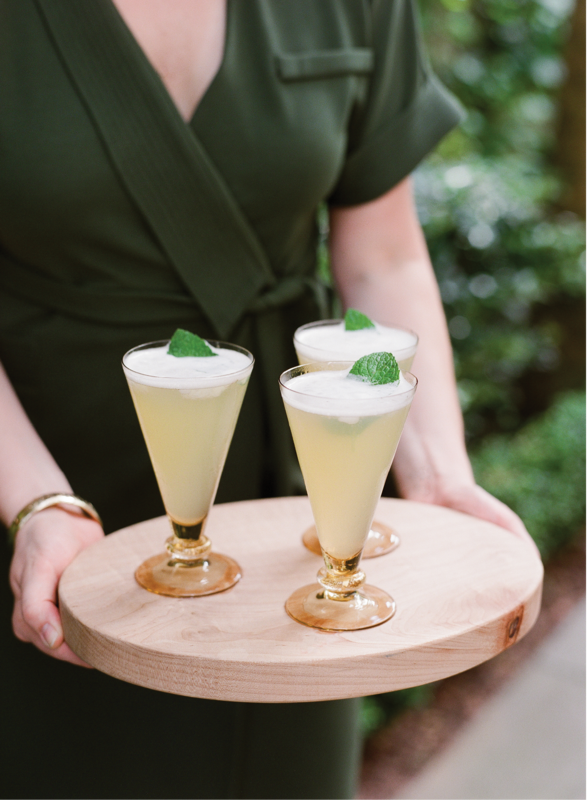 “A nice touch is to freeze fresh herbs in ice cubes for non-alcoholic beverages,” she notes. - Don’t angst over formal flowers. Showcase the best branches or blooms in your garden, or outsource to your favorite florist. Though her professional life entails managing the minutia that goes into logistically complex high-touch destination events, Lynn doesn’t confuse work with pleasure. “My job requires me to be in full management mode, making sure vendors are on point and everything falls into place, but hosting friends is all about being fully present as someone enjoying the experience,” she says. In both cases, though, she doesn’t skimp on creating a beautiful table and all the elements that go into a magical evening. 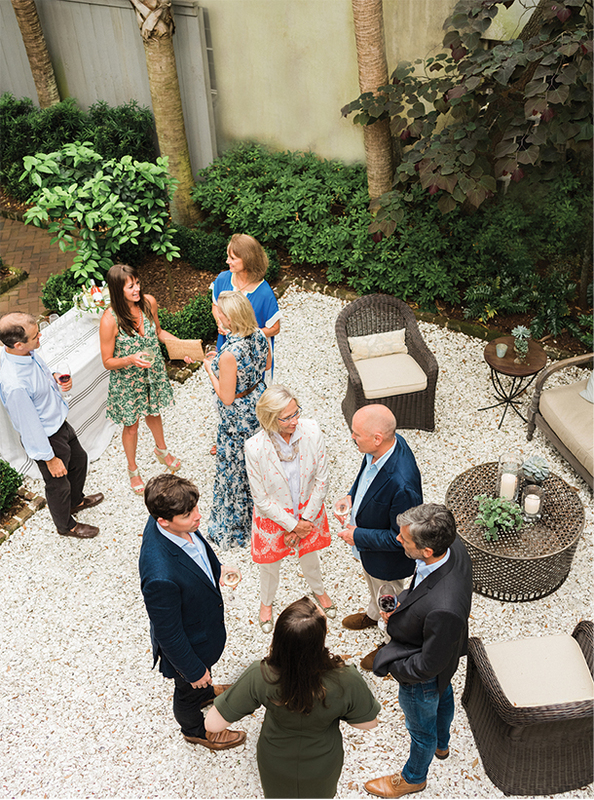 The beauty of entertaining outdoors is that guests feel free to wander a bit and explore, an inclination Lynn likes to encourage. “That’s one of the things I love about Zero George and its interior courtyard. There are all these spaces-within-spaces. 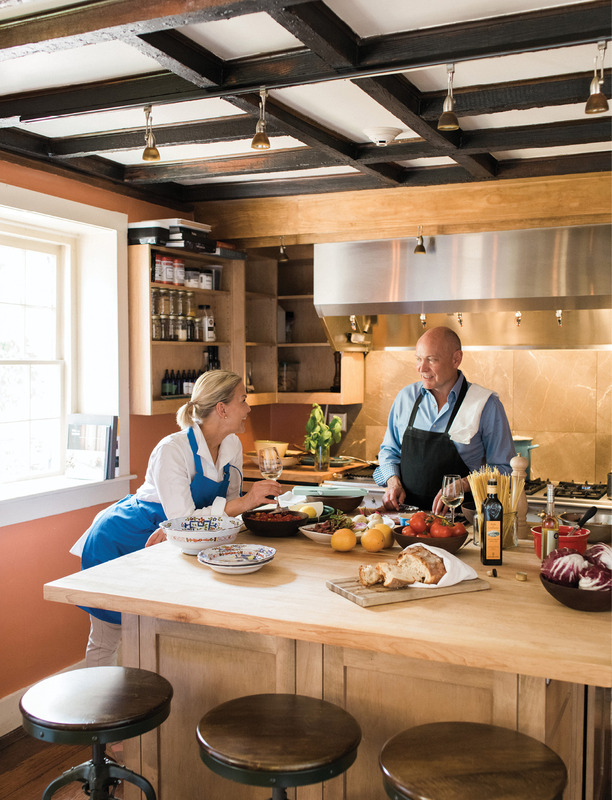 It feels very personal and intimate,” she says, which is also the type of atmosphere Lynn and Dean create at their own home. 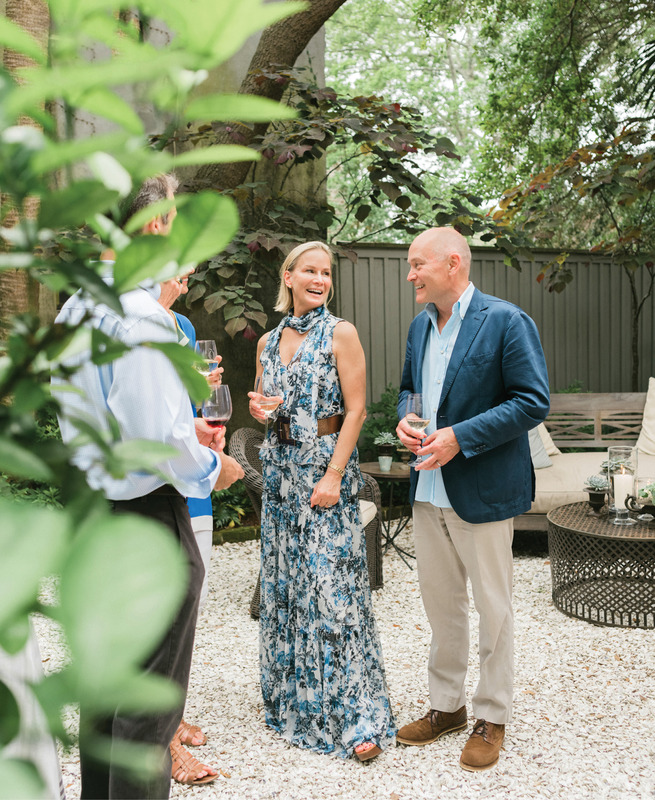 Using an environment to its fullest and in imaginative ways is a signature of an Easton venue and event, whether it be a fully-staged wedding or a relaxed alfresco evening with friends. - Set your playlist in advance. Don’t forget to test the speakers or Bluetooth. - Create a staging area for handbags and coats. And do your best to keep cell phones away from the table, too! - Keep the party moving. Invite guests to different areas. Here, Lynn chose an alcove with oyster tabby as a lounge space for cocktails and appetizers, the courtyard for dinner, and the porch for dessert and after-dinner drinks. - Remember Mother Nature. Prepare for the elements with bug spray, umbrella holders, and a Plan B in case of rain.